The 2010 offseason was dedicated to overhauling the defensive line, and with the overhaul came high expectations. Fans and experts had wide ranging opinions on whether or not the upgrades would make a difference on the field. The Lions made two trades, signed a big money free agent and used two draft picks to upgrade the line and it didn’t take long to see the bottom line. In Week 1 the Lions’ revamped defensive line totalled 22 tackles, 4 sacks, recovered two fumbles, surrendered 3.3 yards per rush and forced a turnover on downs when the Bears had a drive start at the Lions 1 yard line. One of those sacks came from the prized rookie defensive tackle Ndamukong Suh, 11 of those tackles came from the prized free agent Kyle Vanden Bosch and 5 tackles and one sack came from the prized trade acquisition Corey Williams. The Lions’ defensive line racked up 292 tackles, 39 sacks, 9 forced fumbles, 5 fumbles recovered and 2 interceptions in 2010. The 2009 defensive line totaled 221 tackles, 15.5 sacks, 5 forced fumbles, 5 fumbles recovered and 1 interception. The Lions went from having one of the worst lines in the league to having one of the best in one offseason, luckily for the Lions, there shouldn’t be much turnover this offseason. Kyle Vanden Bosch:KVB was a top priority for Jim Schwartz as evidenced by his 12:01 recruitment of him on the opening day of free agency. Schwartz insisted Vanden Bosch was signed because he could still play at a high level, not just for his veteran leadership and non stop motor. KVB’simpact on the field was ultimately not as strong as it was in the locker room, practice field and film room where all of the Lions’ young lineman credited him for their career years. My biggest concern with KVB after his signing was his age and injury history and the injuries caught up with him again. He dealt witha series of leg injuries before getting knocked out for the year on a legal but vicious crack back block on Thanksgiving. KVB had neck surgery before the season ended and is expected to be back at full strength for the offseason programs. Vanden Bosch’s hustle and effort on the field lead to several dominant performances before the injuries caught up to him and robbed him of his quickness and power. 2011 Outlook: KVB has only missed 11 games in the last three years, but has been limited by injuries in each of those years. Players that play with such a high motor can eventually burn their bodies out and it remains to be seen if KVB has hit that point. He will be back in his starting role in 2011 and he’ll have to stay healthy for the line to achieve it’s full potential. Cliff Avril:Cliff Avril lead the league in almosts in 2010. Avril posted a career high 8.5 sacks and was a split second or a few inches away from having 16. Avril has a tall lean frame that he combines withincredible quickness and athleticism. He has long arms to keep offensive tackles from locking onto him and he finally started to master some counter moves. He also started to display a knack for separating the ball from the quarterback. Avril relied too heavily on his speed in his first few seasons, but started to use leverage and set up moves in 2010. Avril is on his way to becoming an elite pass rusher, especially in this defense. Avril did have issues against the run from time to time, but they were compounded by poor linebacker play behind him. He will always be a better pass rusher than run defender, but he has steadily improved in both areas each year. 2011 Outlook:Avril will return to his starting role in 2011 across from Vanden Bosch. Turk McBride: Turk McBride was a failed 2nd round pick to some, but to Gunther Cunningham he was in the wrong place at the wrong time. McBride was drafted in the 2nd round in 2007 by the Chiefs. McBride spent two years as a defensive tackle in the 4-3 before being asked to drop weight and move to outside linebacker in the 3-4 that Todd Haley was installing. McBride was out of place playing in space and was cut during the 2009 season. The Lions signed him and wanted to play him at defensive tackle, but he had dropped down to 265 lbs which was too light to play inside. They asked him to play defensive end for the remainder of the 2009 season and he was impressive enough that they decided to keep him there for 2010. McBride was expected to provide depth at defensive end, but wound up starting eight games due to injuries to KVB and Avril. McBride posted career highs in sacks and forced fumbles and easily repaid Gunther Cunningham for his faith in him. 2011 Outlook: McBride will likely be an unrestricted free agent once the new CBA is signed. I think he has more value to the Lions than any other team and I think he knows that too. The Lions will definitely make him a priority to resign and I expect he will be back in a similar rotational spot starting role in 2011. Lawrence Jackson:Jackson was another player that found himself in the wrong place at the wrong time and became a big contributor for the Lions. Jackson was a first round pick for the Seahawks in 2008 but despite his pass rushing pedigree, they primarily played him on running downs. 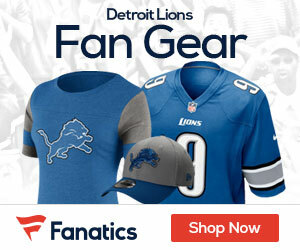 When Pete Carroll took over in 2010, Low Jack didn’t fit the new scheme so the Lions acquired him in a preseason trade. Jackson posted career numbers as a rotational end and flashed the pass rushing ability that made him a first round pick. The Lions loved his size and athleticism and he fit the scheme perfectly. 2011 Outlook:Jackson has the potential to be an every down player if he continues to progress, but in 2011 he will return as a rotational end. Willie Young: The Lions drafted Young in the 7th round as a developmental pass rusher. Young had a strong preseason and earned a roster spot and what appeared to be a role in the defense for the regular season. The acquisition of Jackson pushed Young down on the depth chart but the Lions kept him on the roster out of fear of losing him if they tried to put him on the practice squad. Young is a Cliff Avril clone, tall, lanky and quick but undersized and badly in need of a pro weight program. Young appeared in two games on special teams but didn’t record a tackle in 2010. 2011 Outlook: Young is a developmental prospect who could pan out like Avril with some added weight and if he responds well to coaching. Ndamukong Suh: Rookie defensive tackles don’t make immediate impacts, defensive tackles are risky picks with the 2nd overall pick and a defensive tackle’s best case rookie season would be having 4 or 5 sacks. All three of those statements were true until Suh took the field and shattered all reasonable expectations of what a rookie could do. Suh lead all defensive tackles in sacks, won the Pepsi, Pro Football Weekly, Sporting News and Pro Football Writer’s Association Rookie of the Year awards, was the only rookie starter in the Pro Bowl and the first rookie defensive tackle to ever be named to the All Pro Team. Suh simply dominated on and off the field and took Detroit and the league by storm. 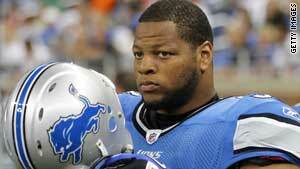 Suh is a natural leader, a great athlete and had an infectious personality that his teammates and fans feed off. Nobody could have predicted the impact Suh would have as a rookie and the great part for the Lions is he still has room to grow. Suh will have a rocky road in 2011 because he was already drawing a lot of double teams in 2010. he will have to continue to refine his technique and improve his strength because he won’t be sneaking up on anybody in 2011. 2011 Outlook: Suh will be the centerpiece of the Lions’ defensive front and will be expected to cope with all the attention opposing offenses will give him. Corey Williams:Corey Williams was the most underrated acquisition the Lions made last offseason. His stats came nowhere near reflecting the impact he had, but Suh’s did. Suh was the lucky recipient of all the stats while Corey Williams caused massive amounts of disruption both versus the run and the pass. Williams has elite explosion off the snap for a tackle and he is so big and powerful that a single blocker can’t block him. Williams’ explosion off the ball was used against him as teams started to employ heavy doses of hard counts and varied quarterback cadences to slow him off the snap. It worked well as Williams easily lead the league in offsides and encroachment penalties. Besides the penalties the only other concern I have with Williams is he is 30 years old and big defensive tackles’ skills can deteriorate quickly. 2011 Outlook:Williams will combine with Suh to form the best interior defensive front in the league in 2011. Sammie Lee Hill:SLH was pressed into a starting role his rookie year and he showed a great deal of promise in 2009. He also showed how raw his technique was and how much he had to learn about playing defensive tackle in the NFL. In 2010 Hill moved into a reserve role and received valuable mentoring from Kyle Vanden Bosch and Corey Williams. Hill was easily the most improved defensive player on the Lions’ roster and would start for most teams in the league. Hill has the size to clog running lanes, the power to collapse the pocket and the athleticism to split double teams and run sideline to sideline in pursuit. 2011 Outlook: Hill is still a developmental player, but he is a valuable member of the Lions’ defensive line rotation and he will continue to be groomed as Corey Williams’ eventual replacement. Andre Fluellen: Andre Fluellen was a talented prospect coming out of Florida State in 2008 but he slid to the 3rd round because of injuries. He was asked to shed weight and play defensive end in his rookie year, then he was asked to gain weight and play tackle when the new coaching staff came in. He has since gotten back up to 300+ lbs, but still found himself playing in both positions in 2010. Fluellen hasn’t lived up to his 3rd round status yet, but he has been a valuable role player filling in in two positions and on special teams. Fluellen is still only 25 years old and the Lions’ coaches like his versatility. 2011 Outlook: Fluellen is probably going to receive some competition in camp most likely in the form of a late round pick or rookie free agent. Andre has immense physical skills, but he hasn’t been able to find a niche for them. He is quick enough to play end, but not quick enough to be an every down end. He is strong enough to play tackle, but not strong enough to be an every down tackle. 2011 Offseason:The Lions number one priority will be to keep this group together. The only player they could lose is McBride and I think there is interest on both sides to make a deal. Fluellen will face competition from someone either on the practice squad like Robert Calloway or another young developmental player acquired this offseason. Other than some camp competition at the bottom of the roster, I don’t expect the Lions to make many moves on the defensive line. I also think McBride will want to stay. I think he’s just beginning to see the full potential of himself, and he’ll want to stay in this situation, under the tutelage of Gunther and KVB…..and I loved seeing every snap Sammy Hill was in this year, I swear, every time I saw his number lined up, he was pushing guys around.